So for the purpose of quick online reference, I created here a list of the most common ways to earn money from blogging. 1. Signing up with Ad Networks – Ad Networks are companies that pay you as a webmaster or blog owner money for allowing their ads to be shown on your blog or site. This topic is explained in detail on the previous post about advertising networks. 2. Selling your own products – if you have products or services that can be sold online then you can market it to your readers or blog visitors. For instance, if you can design and tweak WordPress themes then you can set up a blog featuring your work and sell it to interested readers. 3. Selling other peoples products – commonly called as affiliate marketing. Basically, you earn a commission on every lead or sale you made. Just promote the product on your blog and when somebody buys, you get a commission from the product owner. The most popular affiliate programs are Amazon, JVZoo, and Clickbank. Clickbank, however, choose to operate only on selected countries. 4. Writing reviews – You write a review about a site or a company’s services or products and you’ll get paid a certain amount for it usually from $3 to up to $100 per article. This is probably the most rampant make money online opportunity grabbed by new and regular bloggers alike. 5. Selling txt link ads – Some bloggers are paid monthly by selling text links from their existing blog posts. The downside of this program is that it can really hurt your search engines rankings since Google will penalize sites that buy and sell links. 6. Get paid to display banners – some companies pay bloggers to display banner ads on their blog. 7. Selling private ad space from blogs – selling direct ads to advertisers without the intervention of any third party. You can sell ad banners (usually 125 x 125 in size), txt links or backlinks and also reviews to any interested buyers. 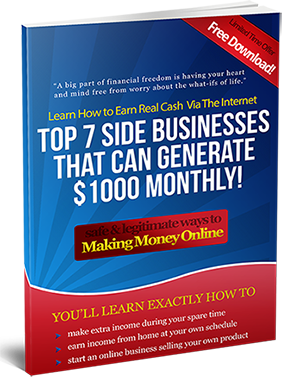 The advantage of this is that you get 100% income. The disadvantage is that you need to have a lots of visitors to get qualified advertisers, and you will need to spend time managing the sales process, the banners and the payments. This needs a marketing knowledge on the part of the blogger. The blog as previously stated must have a good traffic (many bloggers say at least 1000 visitors per day). Also many advertisers prefer buying ads from blogs with higher Google PageRank and Alexa Rank. 8. Donations – some bloggers ask donations from their readers by displaying a PayPal donation button on their blogs. This can be an efficient way to earn money provided that your blog is on a niche where readers learn and gain value from your content. These are by far the most common ways blog writers make money from their blogs. I’ll be updating this lists from time to time. I like the 100 percent income routine with lucky number 7. Also, with number 7, you would have total control over the pricing. My goal is focus more so on the more passive ways to generate income from my blog so that I can focus on my content. We are in same niche and I share some useful information just like you do. Thank you. Great post and great writing style.Could you please write a post about home business, i mean making money online selling ebay items, affiliate marketing etc. both Clickbank and Adsense are good programs to monetize your website, i use both of them ..